Transportation is the lifeblood of local economies and Gateway85’s convenient location, with access to I-85, I-285, Hwy 29, Buford Hwy and Peachtree Industrial Boulevard, has long made it a prime location for businesses and residents. Gateway85 works to improve mobility throughout the district with strategic infrastructure improvements aimed at alleviating congestion in the corridor. From building sidewalks and enhancing intersections to expanding transit access, Gateway85 is committed to making transportation safe and convenient for all that live, work or play in our community. We also work with local, county, state and federal partners to ensure that mobility options are available for all modes of transport within the district. In 2016 the CID joined local and regional partners to celebrate the official completion of the Jimmy Carter Boulevard and I-85 diverging diamond interchange. Not only has the project created an iconic structure that can serve as a symbol of the area’s progress, but it has also achieved its ultimate goal of improving mobility for the thousands of motorists who rely on the corridor every day. Examined transportation and land use improvements : This Livable Centers Initiative Study examined land use and transportation improvements along Indian Trail – Lilburn Road from Beaver Ruin Road to Lawrenceville Highway and generated a 5 year transportation plan with specific needed projects. Two of these projects – two sections of a side path along Indian Trail – have been pre-approved to compete for LCI transportation implementation funds. 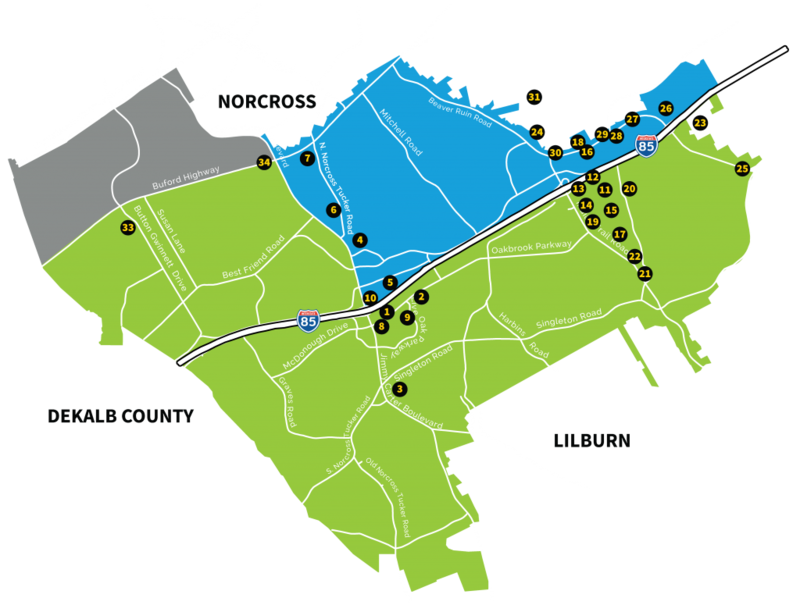 This Livable Centers Initiative Study examined land use and transportation improvements along Jimmy Carter Boulevard from Buford Highway to Singleton Road and generated a 5 year transportation plan with specific needed projects. Two of these projects along the boulevard – safety improvements at Singleton Road and North Norcross Tucker Road – have been pre-approved to compete for LCI transportation implementation funds. To read the study please download the PDF here. To find out more information check out the Jimmy Carter LCI page! The Atlanta Regional Commission initiated a program to examine how the future transportation system investments would accommodate future corridor travel for workers and local residents, within the context of anticipated residential, employment, and development changes. One of the initial studies was Buford Highway from Sidney Marcus Boulevard in Atlanta to SR 120 in Duluth. The CID has been building off these recommendations for improved pedestrian, bicycle and transit opportunities. In 2007, the CID looked at truck traffic along Jimmy Carter Boulevard to ensure the best mobility for our businesses and residents. Interestingly, the existence of truck traffic was more of a perception issue with truck traffic percentage not significantly high on a regional level. Still an opportunity was found to better educate freight drivers on alternate routes to avoid local bottlenecks though signage and outreach, as well as some local through routes roads that need future upgrades. Be sure to check out our various initiatives and projects!